I visited St Pancras & Islington cemetery on Sunday and, as usual, I found the human behaviour just as fascinating as that of the animals. For some, grave visiting has obviously just become a duty that cannot be shirked – I once saw somebody lob a bunch of flowers from their car window onto a grave and then drive off. For others, it is almost a social occasion, with people gathering by the grave for a chat and a party – this is the case with one lad who died when he was just a teenager. His mother, still a young woman herself, comes every weekend and assorted friends and relatives are always sitting next to her on the bench and chatting. For the newly bereaved, dressed in tell-tale black, it is the bleakest of times, a period when not even the sun will make an impact. My heart goes out to these people as they trudge along the still-unfamiliar byways of the cemetery, sometimes getting lost. It always surprises me that the human body can sustain such sorrow without collapsing. Such a soul, wearing a black parka on this warm day, passed me as I walked towards the crematorium. I glanced at her to see if she wanted to speak but she was so deep in her thoughts that she passed without a word. In her, I saw all of us at some time in our lives and her misery touched me deeply. I am not sure if it was my encounter with the mourner that coloured my perception but when I saw a lone man walking towards me, I was suddenly on my guard. He continued to approach and then stopped suddenly. There was no one else around. Why had he stopped and why was he looking at me? Then I saw the head of a fox less than twenty feet away, peeking round behind a gravestone. The man raised his eyebrows, gesticulated towards the fox and then to the camera around my neck. He was trying to tell me that there was something worth photographing. The fox had the long legs and skinny body of this year’s cubs and I was sure that I had seen her before over at the feeding station. She seemed to be adept at finding her own food. There was an area between two graves that had been scratched to pieces – it could have been a site where the fox had been digging for worms, which make up a surprisingly high proportion of their diet at this time of year. Yet, as we watched – the man and I – the fox went to a nearby grave and carried off a small mouse, throwing the corpse into the air a few times and then tossed it about with her front paws, until finally chomping it down. All the time she kept her gaze on us, but made no attempt to run away. A young woman walked down the road, tapping away on her phone. She looked up and stopped. Now, three of us were frozen looking at the fox which moved off and crossed the path. I squatted down and she paused, looking at me with nervous interest. The vixen walked in a circle, paused to squat and urinate, before crossing the road again and sitting down in some bushes less than a metre from the road. That was when I saw the mourner in the black parka again. She stopped when she saw us. Behind her spectacles, her eyes were bloodshot with crying. ‘How can I get to Lygoe Rd?’ she asked. 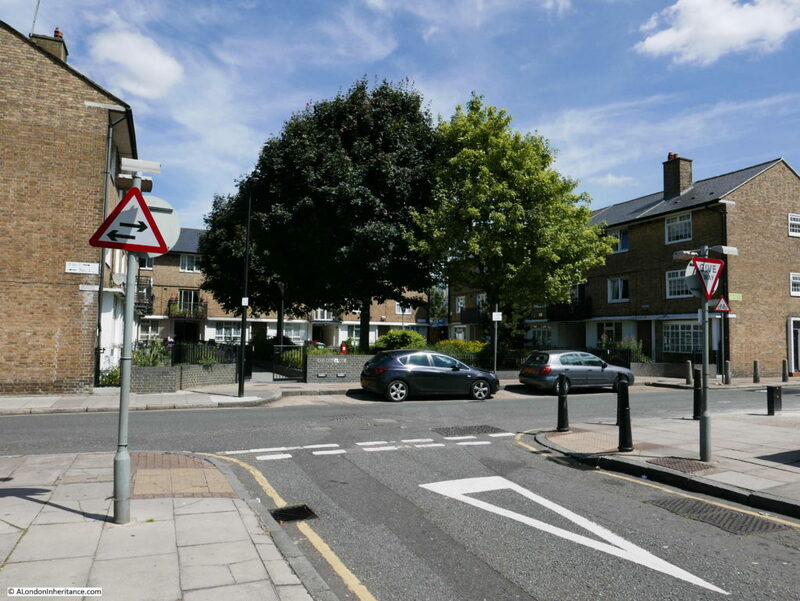 I pointed her in the right direction – Lygoe Rd is one of the main thoroughfares in the cemetery. The fox watched the conversation with interest, even turning her head to look at where I was pointing. Then the woman headed off to visit the grave of someone that she could barely believe was gone forever. I would like to say that she glanced at the fox and that its inquisitive face brought her the smallest of smiles or at least jolted her out of her sadness for a split-second. Yet one day, I hope that she will notice a frosted russet face watching her from a hedge and feel just the smallest of lifts, like the sudden warmth when sun breaks through the clouds. As I watched the black-coated shape turn the corner and disappear from view, I wished her strength and the slow-blooming of hope, and the birth of better days. I wish that for all of us. On the 29th May 1946, the London County Council applied to the Minister of Town & Country Planning for 1,945 acres of Stepney and Poplar to be declared an area of comprehensive development under the 1947 Town and Country Planning Act. The London Docks, plus the presence of industry and the density of population, meant that the East End was a prime target during the last war – with large areas in need of urgent reconstruction by the late forties. Of the total request, 1,312 acres were declared to be an area of ‘Comprehensive Development’ which meant that redevelopment of the area could be planned and implemented as an integrated project with zoning of space and allocation to specific functions such as shops, housing, schools etc. 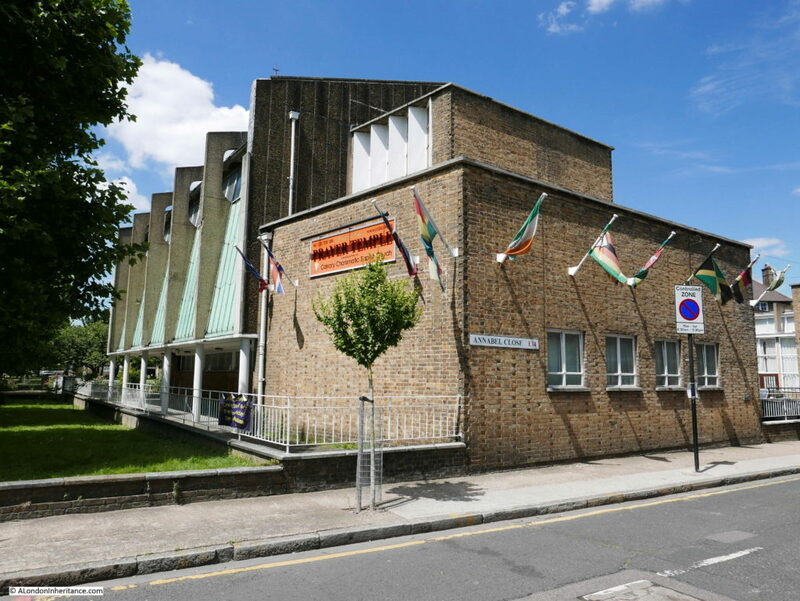 The plans acknowledged that despite the way the city had grown, strong local communities had developed and it was important that these were retained during future development. 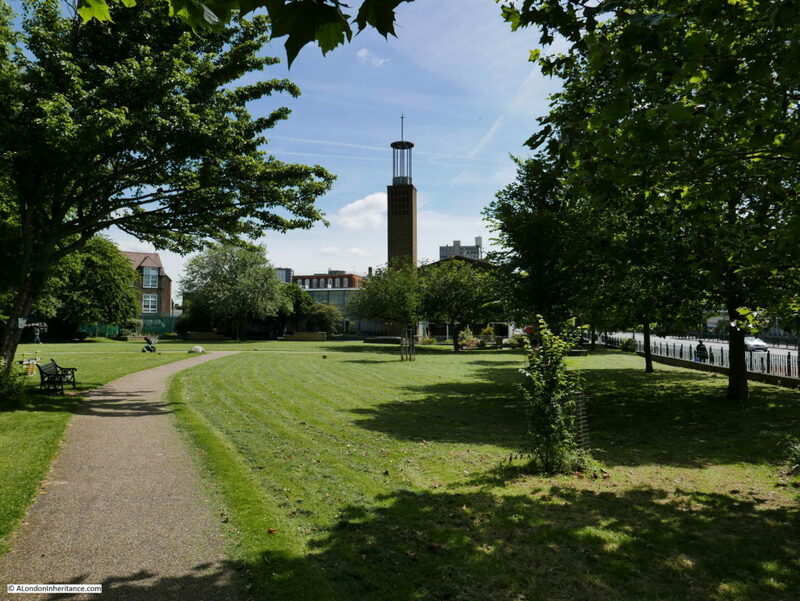 Eleven new neighbourhoods were planned for Stepney and Poplar, each would be developed as if it were a small town with the appropriate local facilities of schools, shops, churches and public space. 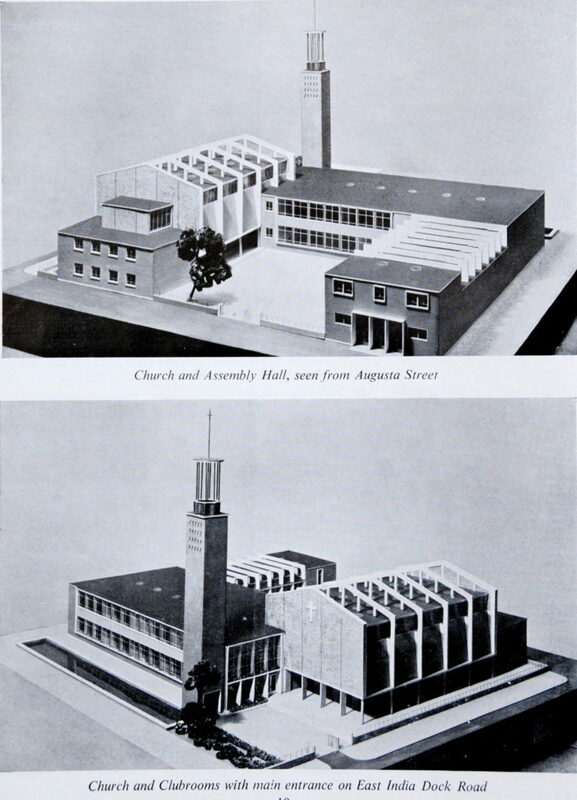 An Exhibition of Architecture was planned for the Festival of Britain and in 1948 the Council for Architecture, Town Planning & Building Research proposed that one of the neighbourhoods to be developed in Stepney and Poplar would be an ideal site to demonstrate the latest approach to town planning, architecture and building. 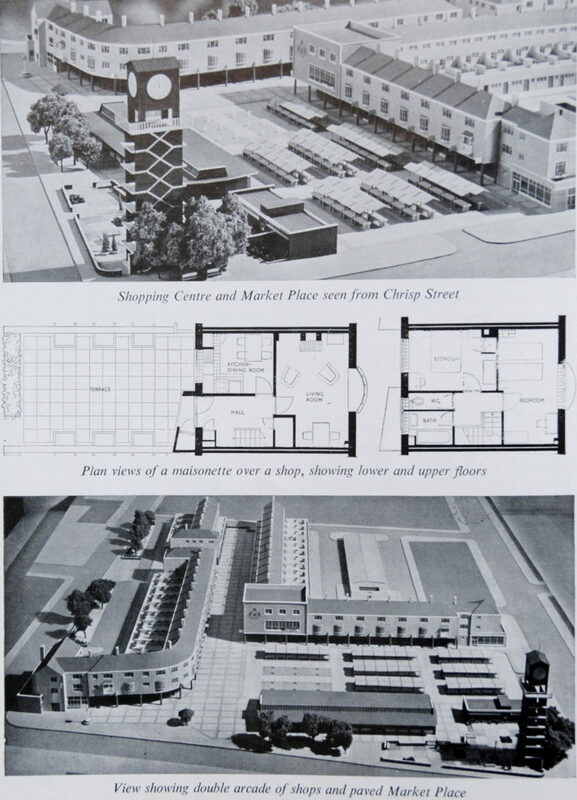 The ‘Lansbury Exhibition of Architecture’ would show how town planning and scientific building principles could provide a better environment in which to live and work, and how this could be applied to the redevelopment of London and the new towns planned across the country. The map gives the impression that this was a fully-finished site. Although construction of many of the buildings had been rushed through ready for the start of the exhibition, work on many others was still in progress and did not reach completion until the closure of the exhibition. A criticism at the time was that the route around the site was hard to follow with lack of clear sign-posting, while the white direction lines painted on the ground became unclear. To explore the Exhibition of Architecture, I took my copy of the guide and arrived on the Dockland Light Railway at All Saints station to undertake the path of the 1951 Festival route. 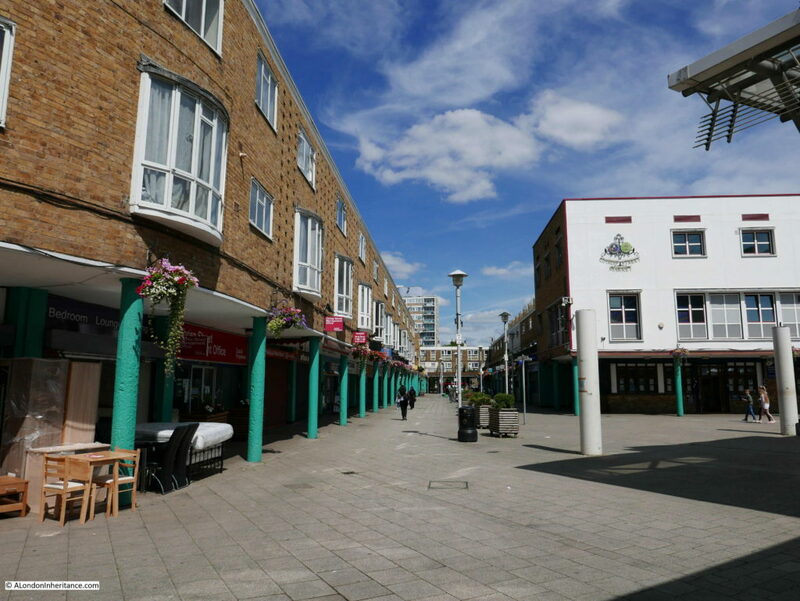 The impact of the Lansbury development was unpopular with many existing residents. A large number were moved to allow for rebuilding to take place. By November 1950, five hundred and thirty-three people had gone and LCC policy was that people were relocated to the next available accommodation. This meant the residents of the Lansbury site were scattered across London. 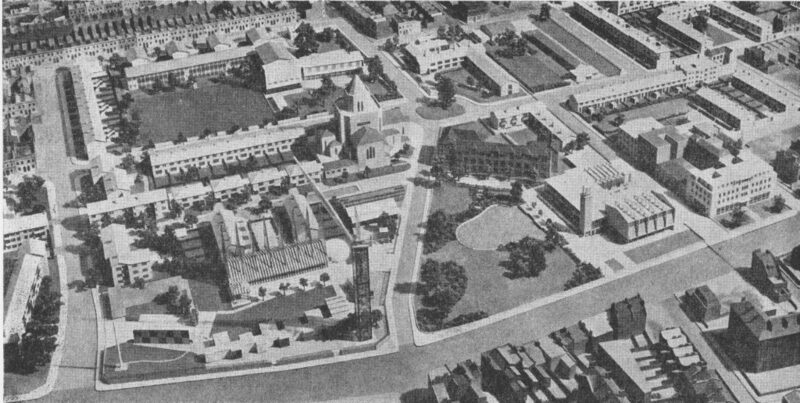 This situation was made worse when the new buildings were ready for occupation, since priority was not given to original residents – rather Lansbury became part of the overall LCC pool of housing. 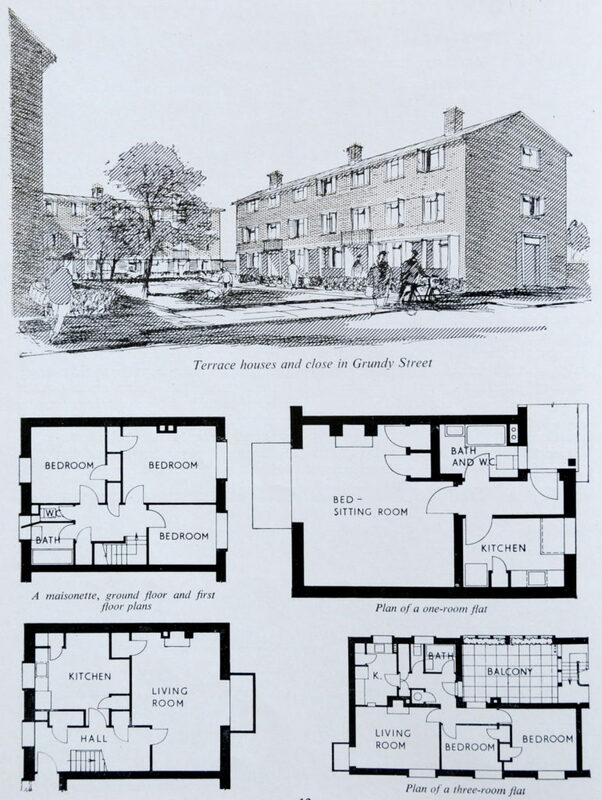 The general view of the architecture at Lansbury at the time was that it was “worthy but dull.” Whilst the estate consisted of buildings ranging from two storey houses up to six storey flats, the overall design was almost uniform and use of the same coloured brick throughout resulted in a lack of architectural diversity. 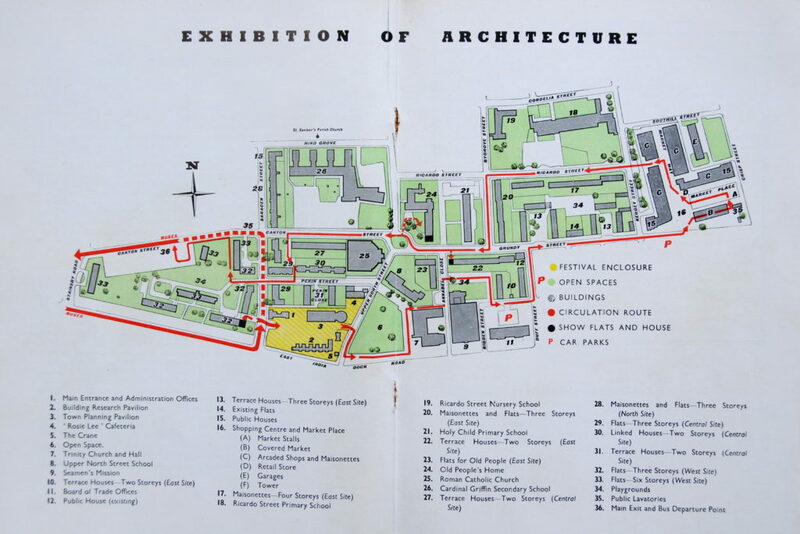 Following closure of the Exhibition of Architecture, Lansbury became simply one among many LCC development sites, with construction continuing through the following decades, filling in the area between the Market and the East India Dock Rd, building north to the Limehouse Cut and west to Burdett Rd. 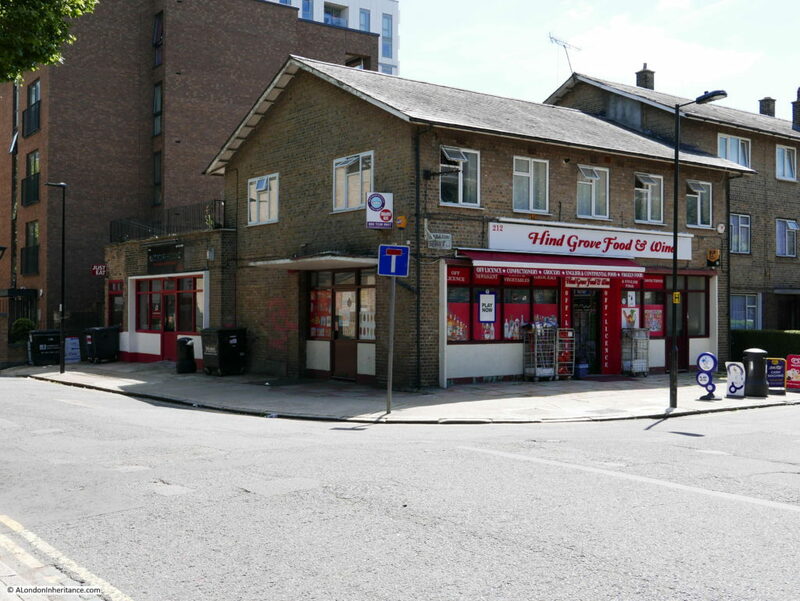 Yet time does not stand still for Lansbury and today the Chrisp St Market area is itself threatened by new development. 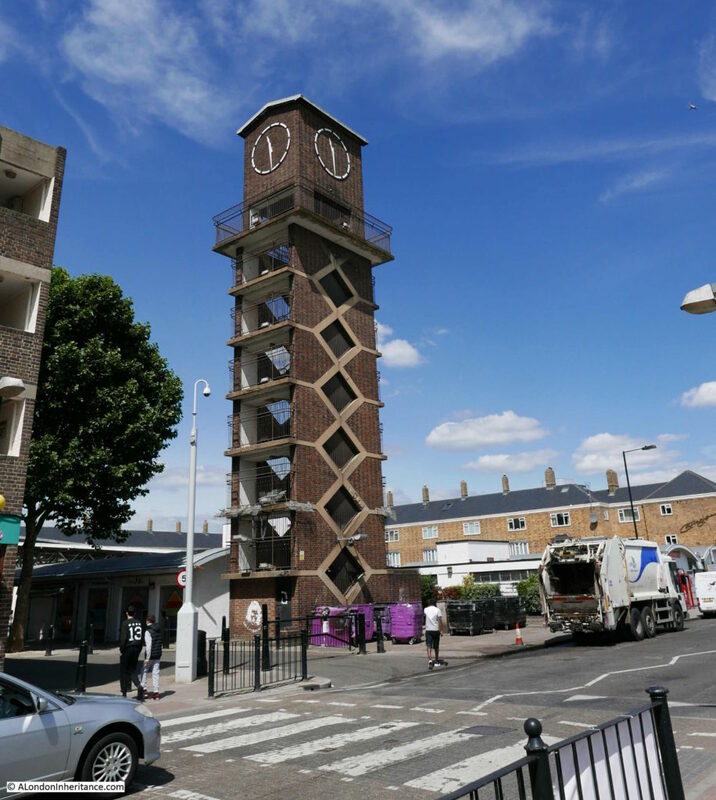 At the corner of the market, alongside Chrisp St is the clock tower built as a key feature of the market. Running up the centre of the tower are two interlocking staircases built of reinforced concrete leading up to the viewing gallery and clock mechanism. The two staircases only met at the top and bottom of the tower so that those walking up would use one staircase and those walking down would use the second – a clever design to avoid congestion on the stairs. 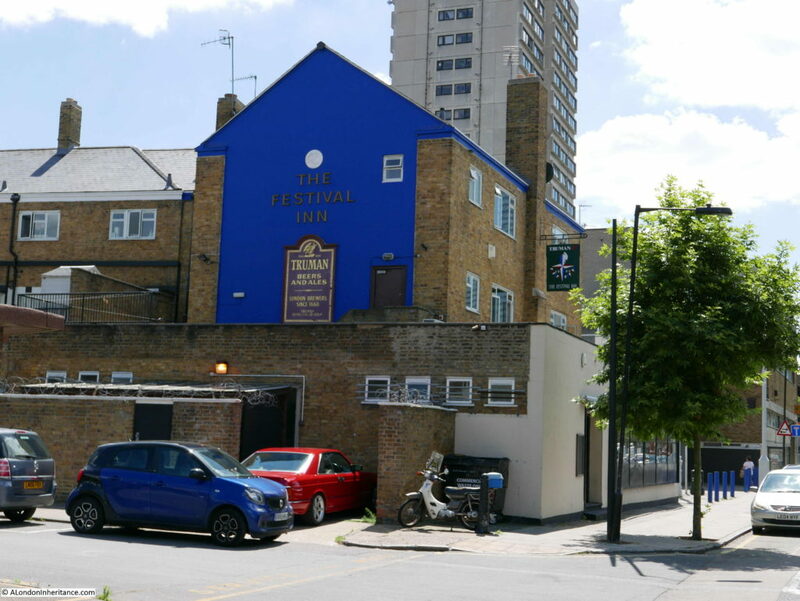 The Festival Inn is on the edge of the Shopping Centre and Chrisp St Market (point 16 on the map) Although the pub sign still uses the festival symbol, there was originally a free standing pub sign consisting of a pole with at the top the model of a group of Londoners dancing around the Skylon. The course will be held at 5 Fournier St, Spitalfields on 19th & 20th November from 10am -5pm on Saturday and 11am-5pm on Sunday. Lunch will be catered by Leila’s Cafe of Arnold Circus and tea, coffee & cakes by the Townhouse are included within the course fee of £300. Email spitalfieldslife@gmail.com to book a place on the course. I read your blog every day, and the humanity and love of London shines through, today’s post was so poignant. Thank you for taking the time to make our days richer. Thanks for the story about the fox and the mourner — it’s been a bad week and the photos and compassion expressed helped. Two Wonderful Stories! Thank You. 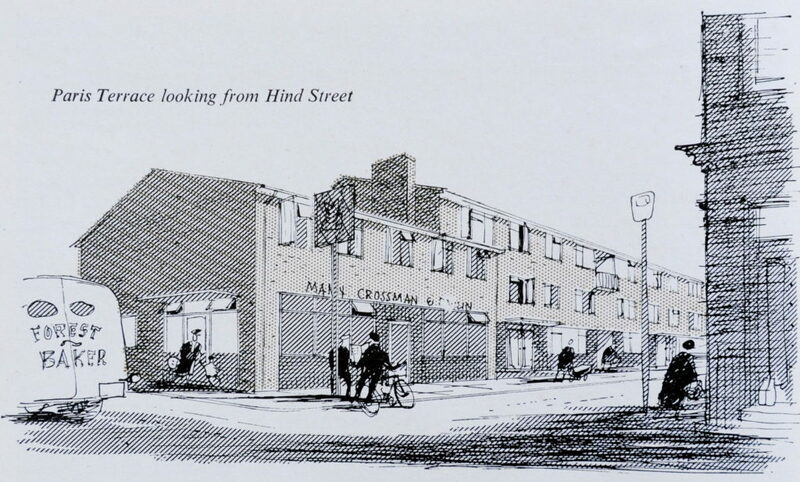 Would you have an Old Map of Chrisp Street area and around, Please to compare. I had family relatives, in the area and wonder how it changed. Whether they’re alive or long gone, in ruins or intact, it’s always a wonder to learn about the people, places, flora and fauna of London. 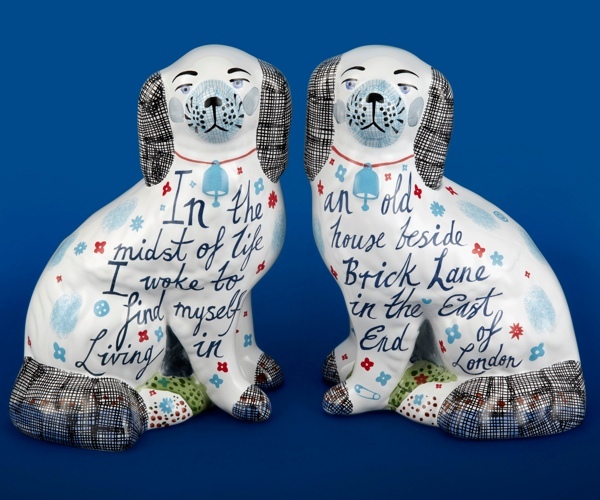 Reading your blog, as well as those of your alumni, is to take a daily day trip to London’s soul. Thank you all for this awesome – and I mean that in a good way – experience!